We had a fantastic turnout for our first event of 2015 at Lake Alex on Sunday. 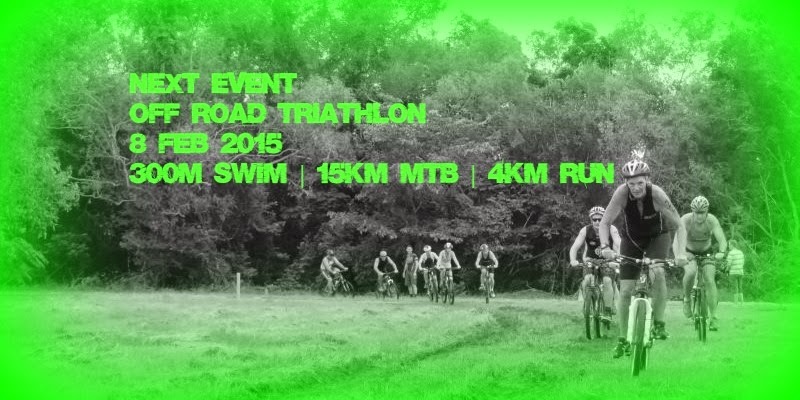 A huge thank you to Aquathlon RD Barry Sullivan for organising this event for us. Shout out also to our wonderful volunteers who covered check in, post race refreshments, water stations etc and to the Blue Cycles team for being on hand and helping out. We also had St John ambulance and Surf Lifesaving present to ensure the safety of our competitors. We welcomed a number of new and returning members and had still others on the sidelines checking out “how we do things” – they were inspired! 1. Course familiarisation: Emma Winterflood will lead a MTB ride through the East Point tracks this Sunday 1st Feb. This ride will be aimed at the beginner level or those just needing to know that the mtb part of the tri isn't so scary after all. We will ride the course as it will be set out for the event. Meet at Lake Alex carpark at 6.45am for a 7am start. Helmet compulsory but non-compulsory coffee at the Cool Spot afterwards! If anyone has any questions about the reccy ride they can call Emma on 0409 906 343 or have a chat to RD Aaron at Cycle Zone. 1. The 2014|2015 age group pointscore has been updated. 2. Items for next E News by Monday please. 1. Joe Byrne didn’t quite make it to check in on Sunday after coming off his bike on the way to Lake Alexander. Timely reminder to take it easy on the bike in the wet conditions. We wish Joe a speedy recovery. 2. Good luck to our members competing at Challenge Melbourne at the weekend including Jac Crofton, Tim Green and Scott Hanrahan. 3. Graeme Parsons and Phil Blumberg are among those heading south to compete at the Glenelg Triathlon on Sunday. Have fun guys! 4. Many of you were spotted in the Australia Day Fun Run crowd. It gets bigger and bigger each year. 5. We welcomed Tony West back on Sunday, been a few years. 6. Good to have Pete Brady back for a visit and a top 10 finish. His give it everything attitude remains unchanged. 7. The Hatty family all participated on Sunday … the family that tri’s together …! 8. We still require some volunteers at a number of upcoming events. If you haven’t yet put your hand in 2014/2015 we would particularly like to see your name on the roster. Check for available spots here and email your preferences asap. 9. And last but not least, a reminder to those on Fruit/Ice to scan and email receipts for reimbursement and to also include account details. Alternatively, place in envelope with amount and account details on front & give to Lisa (Treasurer) or Robyn (Secretary). You don’t need to be out of pocket.